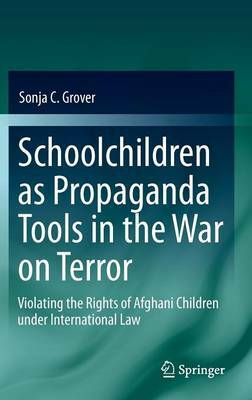 Schoolchildren as Propaganda Tools in the War on Terror: Violating the Rights of Afghani Children under International Law 2011 ed. This book explores in what ways both sides involved in the so-called war on terror are using schoolchildren as propaganda tools while putting the children's security at grave risk. The book explores how terrorists use attacks on education to attempt to destabilize the government while the government and the international aid community use increases in school attendance as an ostensible index of largely illusory progress in the overall security situation and in development. The book challenges the notion that unoccupied civilian schools are not entitled under the law of armed conflict to a high standard of protection which prohibits their use for military purposes. Also examined are the potential violations of international law that can occur when government and education aid workers encourage and facilitate school attendance, as they do, in areas within conflict-affected states such as Afghanistan where security for education is inadequate and the risk of terror attacks on education high. This book explores the ways in which both sides in the so-called 'war on terror' use schoolchildren as tools of propaganda even as they put those children's security at grave risk. It argues that secure schooling free from violence is a right too often absent. 6.4 Humanitarian/Human Rights Rhetoric as a Smokescreen for Non-Humanitarian Objectives?